10 Guantanamo Prisoners Freed In Oman; 45 Detainees Remain : The Two-Way Under President Obama, the detainee population has gone from 242 to 45. But he hasn't closed Guantanamo as pledged, and Donald Trump has called for more suspects to be sent to the prison in Cuba. President Obama shakes hands with Oman's Deputy Prime Minister Sayyid Fahad Bin Mahmood Al Said at Camp David, Md., on May 14, 2015. 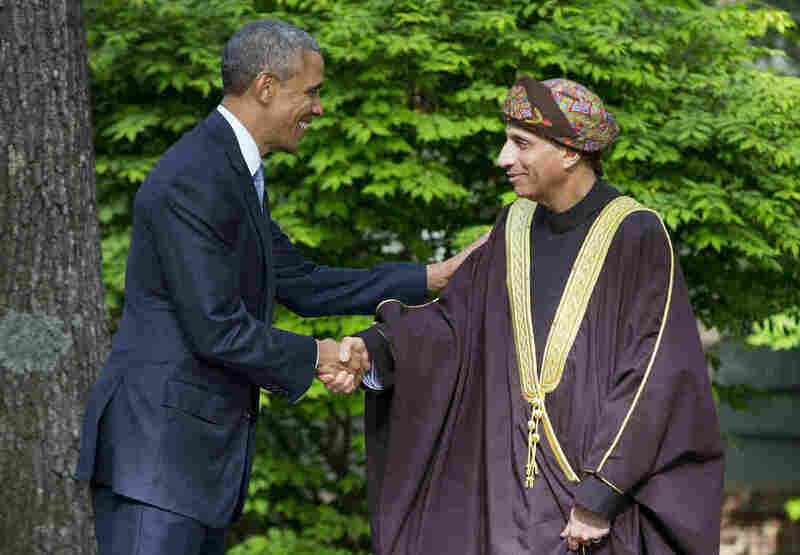 Oman said Monday that it had accepted 10 prisoners being released from Guantanamo Bay in Cuba. That reduces the number of detainees remaining at Guantanamo to 45. The U.S. has released 10 prisoners from Guantanamo Bay to the Arab nation of Oman, reducing the detainee population to 45 in the waning days of the Obama administration. The freed prisoners were not identified by name or nationality, though the Oman News Agency, citing the country's Foreign Ministry, reported that the 10 had arrived in the country on Monday for "temporary residence." Prior to Monday's announcement, Oman had taken in 20 Guantanamo detainees over the past two years, and all of them were from Oman's neighbor, Yemen. At its peak, Guantanamo had close to 700 prisoners. When President Obama entered office in January 2009, he immediately pledged to close the prison in Cuba, which was down to 242 detainees at the time. Many have been released to their home countries or to other nations over the past eight years. However, most of those still in Guantanamo are considered by U.S. authorities to be too dangerous to be released, and Congress has barred them from being brought to the United States. President-elect Donald Trump recently called on the Obama administration to stop releasing Guantanamo prisoners. On Jan 3, Trump tweeted: "There should be no further releases from Gitmo. These are extremely dangerous people and should not be allowed back onto the battlefield." The Obama administration promptly rejected Trump's call. Trump said during the presidential campaign he would like to see additional terror suspects sent to the prison. "We're gonna load it up with some bad dudes, believe me, we're gonna load it up," Trump said last February.